PLATAIA (Plataea) was the Naiad-nymph of the fresh-water springs of the town of Plataia on Mount Kithairon (Cithaeron) in Boiotia (central Greece). She was carried off to the mountain by Zeus who seized her from her river-god father's streams. Plataia was also named Gargaphia after her spring and Oeroe for the small stream which flowed from its waters. "Of these [nine] daughters [of Asopos] Zeus, giver of good things, took his [Asopos'] child Aigina (Aegina) . . from her father's . . [Zeus' other two victims were Thebe and Plataia (Plataea)]." "[The name of the town Plataia (Plataea) in Boiotia] comes from Plataia, whom they consider to be a daughter of the river Asopos (Asopus)." "[At Plataia (Plataea) in Boiotia there is] a hero-shrine of Plataia." 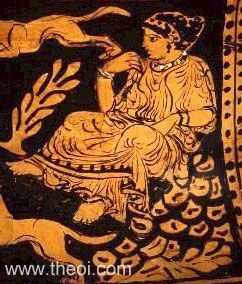 "On the road from Plataia (Plataea) to Thebes is the river Oeroe, said to have been a daughter of the Asopos (Asopus)." "Hera, they say, was for some reason or other angry with Zeus, and had retreated to Euboia (Euboea). Zeus, failing to make her changer her mind, visited Kithairon (Cithaeron) . . . he ordered Zeus to make an image of wood, and to carry it, wrapped up, in a bullock wagon, and to say that he was celebrating his marriage to Plataia (Plataea), the daughter of Asopos (Asopus). So Zeus followed the advise of Kithairon. Hera heard the news at once, and at once appeared on the scene. But when she came near the wagon and tore away the dress from the image, she was pleased at the deceit, on finding it a wooden image and not a bride, and was reconciled to Zeus." "A tract of ground which lies in front of Plataia (Plataea), at the distance of ten furlongs from the Asopos (Asopus Rover) and fount Gargaphia . . . This tract was a sort of island in the continent: for there is a river which, dividing near its source, runs down from Mount Kithairon (Cithaeron) into the plain below in two streams, flowing in channels about three furlongs apart, which after a while unite and become one. The name of this river is Oeroe, and the dwellers in those parts call it, the daughter of the Asopos." "Asopos made his home in Phlios (Phlius) [the land of Sikyon], where he married Metope, the daughter of Ladon, to whom were born two sons, Pelasgos and Ismenos, and twelve daughters, Korkyra (Corcyra) and Salamis, also Aigina (Aegina), Peirene, and Kleone (Cleone), then Thebe, Tanagra, Thespeia, and Asopis [probably Plataia (Plataea)], also Sinope, and finally Ornia and Khalkis (Chalcis)." "There was a valley [on Mount Kithairon (Cithaeron)] clothed in hanging woods of pine and cypress, named Gargaphia, sacred to chaste Diana [Artemis], huntress queen. Deep in its farthest combe, framed by the woods, a cave lay hid, not fashioned by man's art, but nature's talent copied artistry, for in the living limestone she had carved a natural arch; and there a limpid spring flowed lightly babbling into a wide pool. Its waters girdled with a grassy sward. Here, tired after the hunt, the goddess loved her Nymphae (Nymphs) to bathe her with the water's balm. Reaching the cave, she gave her spear and quiver and bow unstrung to an attendant Nympha; others received her robes over their arms . . . [and while she was bathing there, the hunter Aktaion (Actaeon) spied her naked and was transformed by the goddess into a stag]." "[When Artemis was bathing in the Gargaphian spring :] A Naias Nymphe (Naiad Nymph) unveiled [probably Gargaphie] espied him [Aktaion (Actaeon) the Hunter] from afar with a sidelong look, as he stared with stolen glances on the unclothed shape of her queen [Artemis], and shrieked in horror, telling her queen the wild daring of a lovesick man [and Artemis changed him into a stag to be torn apart by his own dogs]."